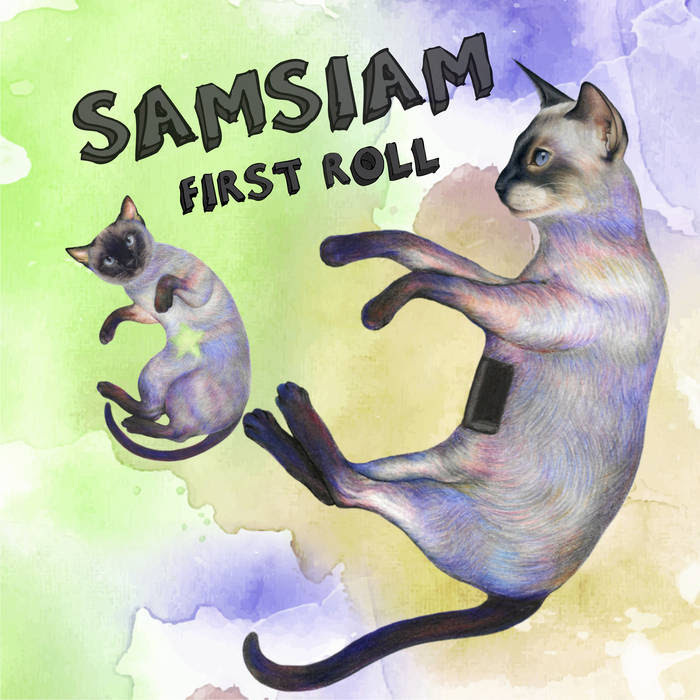 Samsiam recently released his latest instrumental effort ‘First Roll’ after receiving the ‘Parsons Music Guitar Legend Champion’ award back in 2015. Opening track ‘Liu’ fades in with a celtic-inspired riff with the gradual inclusion of bright acoustic guitars (and maybe even mandolin), over a tripping 6/8 rhythm. As the song progresses, it’s clear to see Samsian displaying a similar tone to guitar greats such as Lukather and Vai, with a touch more distortion. As the chords and rhythms shift and change erratically, like John Frusciante’s more recent solo output, the guitar follows suit with abrasive string bends and octave work. ‘Liu’ moves towards folk with a pretty picking part on the acoustic before launching into some gothic choral stabs. The final crescendo comes with its fair share of sweep picking and hammer-ons, before residing to a crisp and clear acoustic guitar and a lasting gong, as the repetitive lead guitars simmer into the distance. ‘CATaclysm’ (clearly noting the obscure cat artwork of the EP) is a much heavier track. After the resonance-laden intro, the drums come pounding in with rolling toms and gunshot snares, not unlike Taylor Hawkins on a Foo Fighters number. This song sees a much heavier use of vibrato by Samsiam, almost flirting with self-indulgence, whilst keeping it in line with the rest of the instrumentation. There is also inclusion of sprinkled Van Halen ’80s synths in the background, providing a nice touch to the generally darker landscape presented so far. The drums continue to rumble on the toms as a dissonant and scuzzy chord progression enters. As the lead guitar comes back in, it bears a striking resemblance to Daft Punk’s ‘Aerodynamic’, with open hi-hats adding an element of dance to the piece. The song is tightly wrapped up with harmonised guitars to the end, before the echoes of the swirling leads decline away smoothly. Final and title track ‘First Roll’ begins with an ascending harmony line in the light of Tenacious D, inverting into a heavy riff that could be a carbon copy for The Strokes’ ‘Metabolism’ if it wasn’t so clouded by the frantic tremolo picking trying to squeeze into every orifice of the speaker. The track also sees an aggressive application of the whammy bar over jarring 7th chords, which gradually becomes more melodic over chugging rhythm and splashy hi hats. This is swiftly followed by more tremolo picking in an intense chiming refrain. For a brief interlude, the use of Latin rhythms and added reverb provides a clear nod in the direction of Santana. Samsiam reverts back to the scuzzy metal sound from earlier, but the main guitar work this time channels Eric Johnson stylistically, with his dry, clean phrasing. There is one final twist, as the final minute of the EP is solely a lo-fi skuffle jazz guitar, EQ’d as if being played through a transistor radio from the 50’s. The lead playing in this final part is on the acoustic, with tight runs in the vain of Django Reinhardt, offering an unexpected but pleasurable development. Overall, ‘First Roll’ shows why Samsiam was awarded the 2015 Parsons Music Guitar Legend Champion honour. He includes so many styles and techniques on the guitar that he has mastered and utilised throughout this EP. The mix is clear and the production generally solid. At times it can be slightly too clean and over-produced, sounding like a play-along CD you might get in a Guitarist Magazine, but this certainly doesn’t detract from the skill and ability being portrayed on this debut. In future, I’d like to hear him experiment more with his lead playing tone to prevent him being pigeonholed, and to set him apart from his contemporaries. Nevertheless, if this is merely the beginning, Samsiam could soon be one of the best guitarists that Hong Kong has to offer.